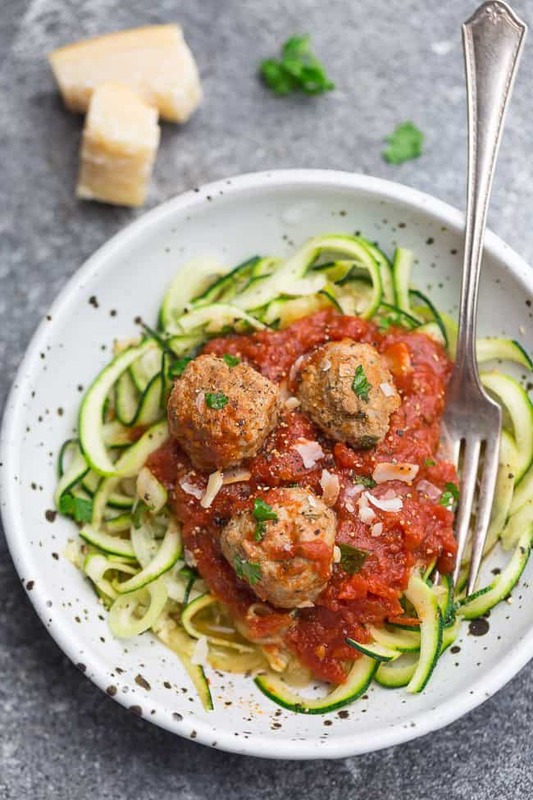 Zucchini Noodles with Meatballs and Tomato Sauce – a healthy and delicious low carb, gluten free “pasta” dinner perfect for a date night in or busy weeknight. Zucchini spaghetti made with a homemade or jarred marinara sauce and spiralized zoodles. Got lots of garden zucchini to use up? That’s when oodles of zoodles come to the rescue. 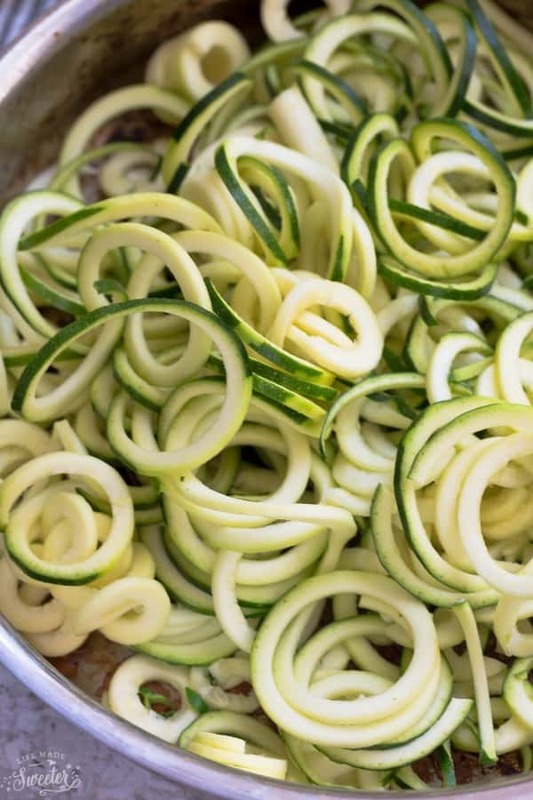 Spiralized zucchini noodles are a popular favorite if you are looking for a healthy grain free / paleo / low carb / whole 30 noodle option. 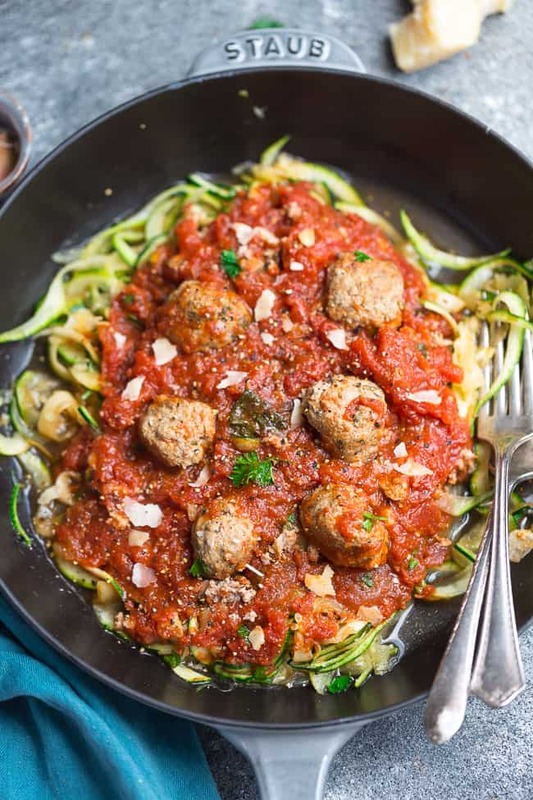 This recipe for Zucchini Noodles with Meatballs and Tomato Sauce is a healthier low carb / keto-friendly twist on the classic comfort dish Spaghetti with Meatballs. It comes together using easy to find pantry ingredients and is simple to customize. It works great if you want a special date-night with an entire homemade meal route. Or, you can also add in some store-bought shortcuts for busy weeknights when you want a quick 30 minute dinner. 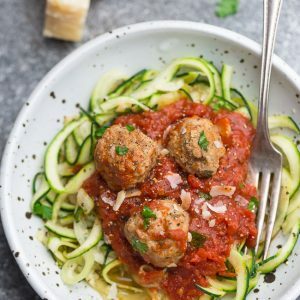 Zucchini Noodles with Meatballs and Tomato Sauce - a healthy low carb, gluten free "pasta" dinner. 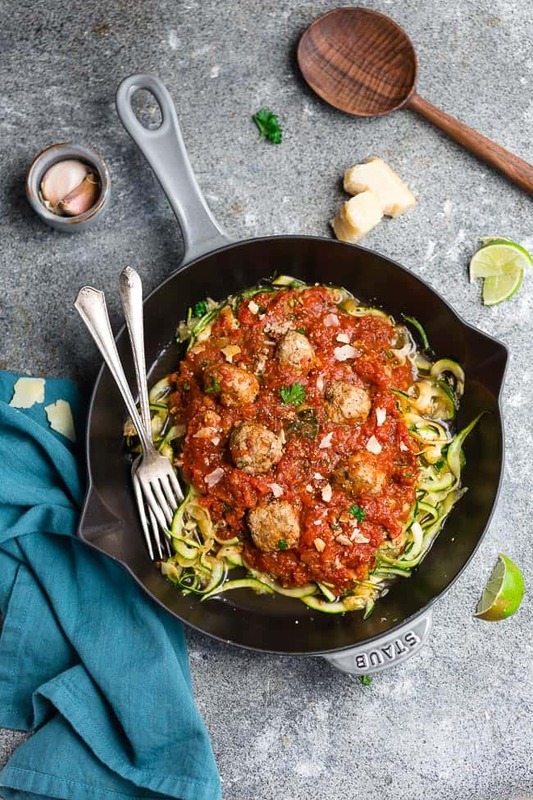 Made with a homemade or jarred marinara sauce and spiralized zoodles. Discard oil and wipe down the same skillet. Heat 2 teaspoons olive oil on medium-high heat. Add onions, carrots, and garlic and cook until softened and fragrant. Season with salt and pepper. Add tomato paste and cook for 30 seconds. 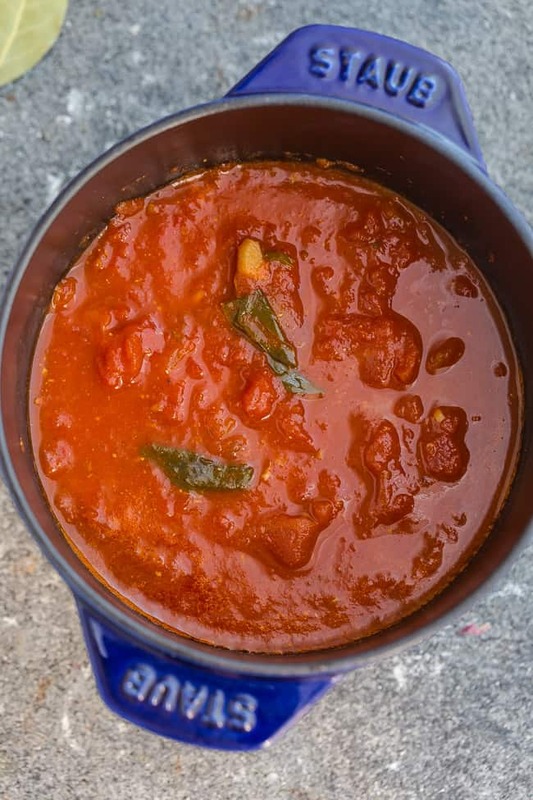 Add the tomatoes, broth, oregano and bay leaf. Bring to a boil and simmer gently until sauce thickens about 20 minutes. Stir in basil and adjust seasonings as needed. Add the cooked meatballs and simmer, until heated through. To cook zoodles, lightly oil a pan over medium-high heat. Add zucchini and saute for 1-2 minutes or slightly softened but still tender. Do not overcook.